CHG’s people-centric culture paired with our accolades, means a lot of applications and a lot of referrals. So, what does it take to get hired at CHG? Here are four things our talent acquisition team looks for when evaluating potential job candidates. The reason CHG is a great place to work is because of our people and the core values they uphold every day — Putting People First, Continuous Improvement, Integrity and Ethics, Quality and Professionalism, and Growth. 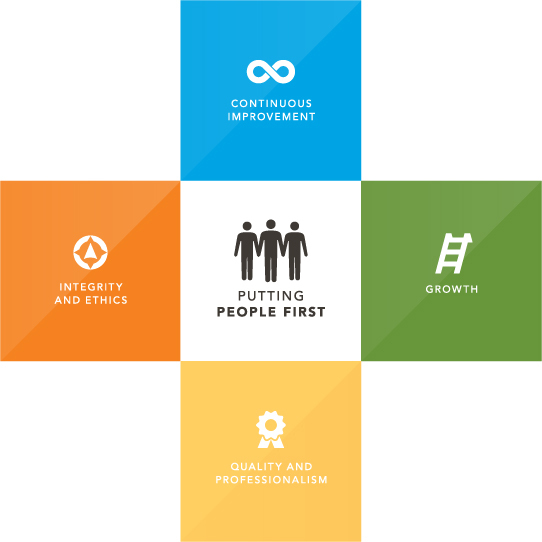 These core values are the foundation of our people-centric culture, providing us the opportunity to elevate our thinking and empower our people to be their best. Job candidates are evaluated based on these core values to determine if they are a good culture fit. Putting People First: A successful candidate makes decisions with the best interests of everyone in mind, considers the thoughts and feelings of others before acting, participates and shares his or her point of view in an open, honest and respectful manner, recognizes and celebrates the success of co-workers, and takes care of team members and our communities. Continuous Improvement: Candidates that exhibits this core value constantly seek opportunities to improve the way we collaborate, actively seek ways to improve processes, work to improve their skills through active participation in individual development, welcome and respond positively to feedback. Integrity and Ethics: Traits of these core values include being honest and trustworthy at all times, working hard to ensure transparency and honesty in all interactions and communications, and holding yourself and others accountable. Quality and Professionalism: These core values encourage people to do their highest quality work in their jobs every day, seek to understand the needs of co-workers and clients in order to better serve them, pay close attention to detail before claiming a task or project is complete, and deliver what they say they will deliver. Growth: A person who’s a good culture fit sets stretch goals, meets goals and objectives, believes that business success translates to more opportunities for everyone within the company, and shares successful strategies and techniques across teams, departments and divisions to help us grow and improve our business. Sales roles: Competitive, driven and motived to succeed in a fast-paced sales environment while demonstrating a sense of urgency. Support roles: Ability to work proficiently while seeing the fine details and not letting errors slip through the cracks. Our core value of Continuous Improvement means we look for someone who has the ability to take feedback from a leader or peer and be open to listening and implementing the feedback. Our philosophy is to make a difference not only to the medical providers we place and the millions of patients they serve, but to our people and the communities we live in. So, passion and excitement for making a difference is an integral factor in succeeding at our company. If you feel like you are a good fit for CHG, check out the open jobs on our careers page. Thank you for sharing your culture with us.